There are 6 lengths of 2x10x10 and 6 lengths of 2x10x8 for the sides of the raised beds. Three beds in all will be constructed. 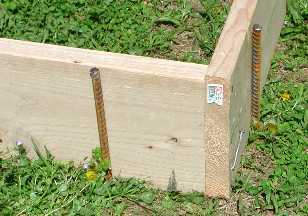 Boards will be secured with two nails per corner and 18" long (3/4" diameter) rebar. The three beds will be constructed between the back of my office building and the sidewalk. This is an eastern exposure. The area was first staked out (four corners per bed) and the lumber laid out. Two nails per joint connect the lumber. Each bed is approximately 8' x 10' (80 sq feet). Beds are 2.5' from the sidewalk and have approximately 2.5' - 3' between each bed. Outer areas will be heavily mulched once beds are filled to keep landscaping crews and their mowers away from the area. 18" rebar was placed approximately 6-10" from the corners for added support. A center rebar per side will be added only if the pressure from the soil causes significant bowing. 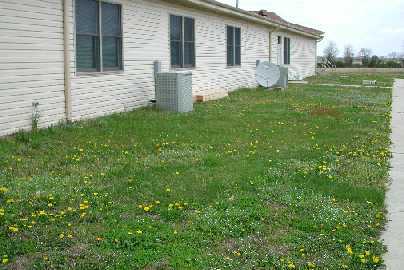 As can be seen in photos above, weeds are a huge problem in this area. We lined the beds with a weed control film prior to filling. 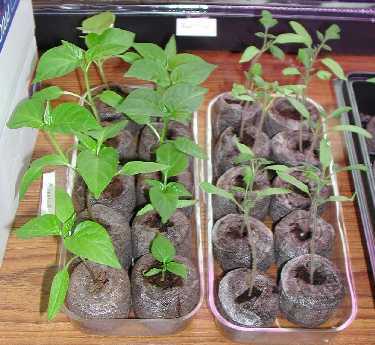 The plastic planters are being used for weight before the beds were filled. Filling these beds was easier than anticipated since top soil was delivered in a dump truck. Not everyone is going to be so fortunate. 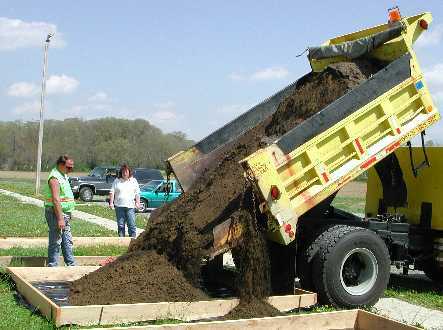 It takes 60 to 80 cubic feet of soil (8' x 10' x ¾' to 1') depending on desired depth. Beds were smoothed and fertilized and watered to promote settling. Picture was taken on 5-7-02. Plants will move outside by the end of next week. 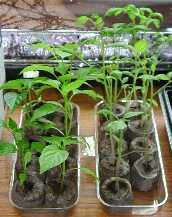 Started 6 varieties of peppers about 2-3 weeks after the first set. 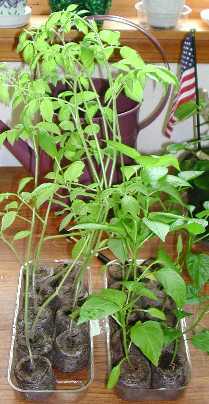 Had spotty germination with these - reseeded some pots after about 2.5 weeks with no growth.